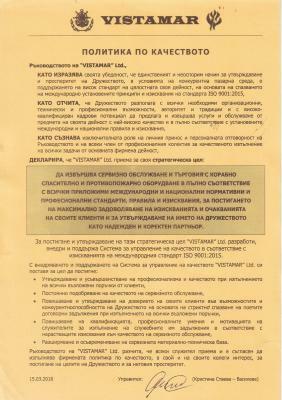 VISTAMAR Ltd. was established in 1991 like a small family company by Captain Stayko Staev. The main scope of activity is service and sale of Marine Life-saving and Fire-fighting equipment on board of motor vessels and on buildings on land. In the past more than 20 years the company has confirmed its stable positions as a reliable partner on the Bulgarian market by many worldwide recognized classification bodies and shipping registers. The company runs a Quality Management System ISO 9001 since 2000 year and goes through successfully the new versions of the standard. The company starts implementation of Еnvironmental Management System ISO 14001 in 2018 year. Vistamar Ltd. has modern service stations, shopping centers and offices in both Burgas and Varna cities in Bulgaria. The company takes care for the clients in whole country with its own auto park and by using a modern mobile service station for servicing fire-fighting equipment. Vistamar Ltd successfully runs and maintains an electronic web shop for direct sales to clients in Bulgaria and abroad.